A new pilot study, conducted by the University of Rochester’s Mt. Hope Family Center, finds that children with fetal alcohol spectrum disorders (FASD) and their families benefit from a multi-component intervention. Children who received the intervention showed lower levels of anxiety and modest, but significant, gains in their ability to control emotions better. The biggest change, however, came in the parents’ understanding of their children’s disabilities and their improved ability to respond to their children’s needs. “The biggest impact is the effect on parents,” says Christie Petrenko, a research psychologist at the University of Rochester’s Mt. Hope Family Center and the lead author of the study. The blue on this bar graph shows results for the intervention group that received the Families on Track program. People with FASD are at increased risk for developing costly and debilitating problems if the underlying disability is not recognized. Primary disabilities manifest themselves in problems with executive functioning, which includes skills such as information processing, emotion regulation, impulse control, and task planning, as well as social and adaptive skills. When these primary disabilities are not addressed, people with FASD are at high risk for secondary problems, such as mental health issues, behaving disruptively at school or dropping out, abusing illegal substances, getting into trouble with the law, and being incarcerated. They often have difficulty holding down a job and living independently. Nationwide, estimates for the number of people with FASD range from 1 percent to 4.8 percent. The Rochester pilot tested a multi-component intervention ­– called the Families on Track Integrated Preventive Intervention Program – to try to avoid those secondary problems, and to improve the way affected families respond to their children. The study is published in the journal Alcoholism: Clinical and Experimental Research. The pilot program is designed to help parents, caregivers, and teachers accurately understand the child’s neurodevelopmental weaknesses as well as their strengths, and to put more effective accommodations into place, adds Petrenko. The caregivers and parents who received the multi-component intervention experienced medium to large effects on their ability to interpret the children’s behavior correctly, finding social support, and taking care of themselves. They also reported feeling more confident in their parenting. The researchers observed medium-sized improvements in both groups when it came to reducing the children’s disruptive behavior. The study included 30 children with FASD, aged four through eight, and their primary caregivers. The researchers randomized the families to either the Families on Track program, or an active control group that received neuropsychological assessments and personalized community referrals only. 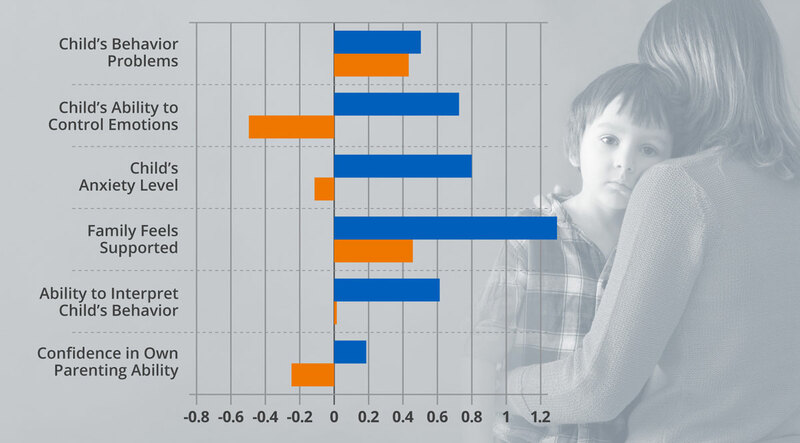 The pilot, funded by a grant from the National Institute on Alcohol Abuse and Alcoholism, builds on earlier research that looked at program characteristics most helpful to parents and caregivers of children with FASD, and problems families face in accessing relevant services, which can make it harder to prevent secondary conditions. The next step, Petrenko says, is a larger sample, randomized control trial of the Families on Track program.